U.S. stocks have enjoyed one of their best performance runs in months over the past week, thanks to a raft of strong corporate earnings. The S&P 500 climbed to a year-to-date gain of 5.2 percent on Wednesday close, a 5-month high. Other major U.S. stock benchmarks, including the Dow Jones and Nasdaq Composite, posted similar strong gains. 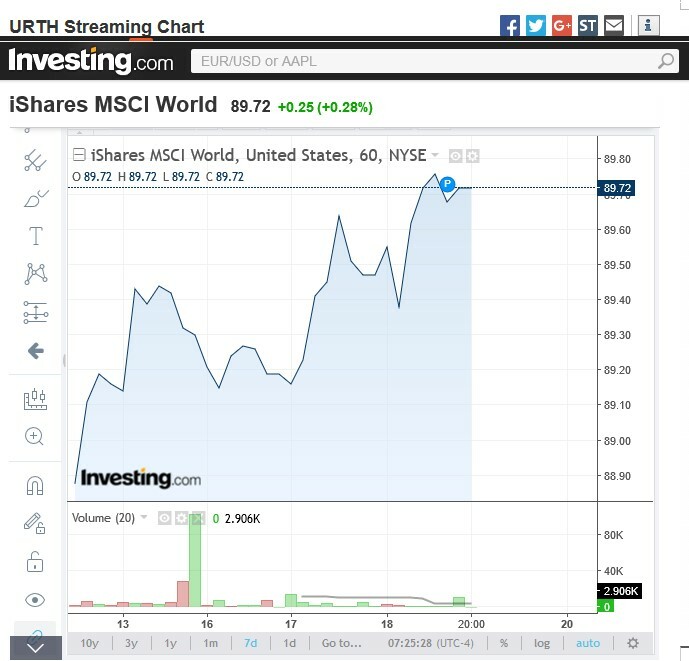 Global stocks climbed in tandem, sending the iShares MSCI World Index (URTH) one percent higher to a five-month high, too, likely buoyed by Powell’s recent comments that the U.S. economy remains resilient enough to warrant more rate hikes. The pan-European FTSEurofirst 300 index (FTEU3) climbed nearly a percentage point to a one-month high supported by weakening regional currencies and strong earnings coming from tech companies such as Ericsson (ERICB:SS) (NASDAQ:ERIC). The U.S. dollar continued on its bullish trajectory, strengthening against the euro and other world leading currencies. 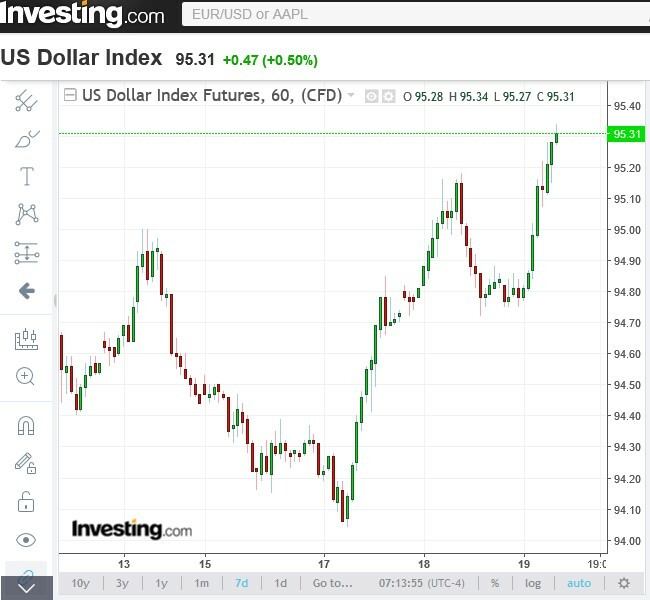 The U.S. Dollar Index has rallied two percent over the past two days after the Fed’s latest hawkish tone signaled more rate hikes in the pipeline (higher interest rates generally make the dollar stronger). The same can, however, not be said of the euro which fell from 1.730 to the greenback to 1.600 over the past two days, pressured by a stronger dollar despite increasing belief that the risk of Italy leaving the regional currency has subsided. The pound sterling and yen also weakened against the dollar. Crude oil prices took a serious hit during the week, with Brent falling almost nine percent from last week's high above $79 after new data showed increasing output in the U.S. as well as lower compliance by OPEC/NOPEC, which fell to 120 percent in June from 147 percent in May. The U.S. Energy Information Administration(EIA) said on Wednesday that U.S. crude production had hit 11 barrels per day for the first time thanks to a rapid increase in shale drilling, which has helped the country add 1 million bpd since November. Technical analyst at London brokerage PVM Oil Associates, Robin Bieber, has declared that the outlook remains negative. Meanwhile, spot gold continued its big selloff, with the latest downside break taking prices to as low as $1,211.50 per ounce on Thursday trading--a one-year low. Gold has been facing immense selling pressure from a strengthening dollar in the near-term. However, reprieve might yet come to the yellow metal after Fed made further tightening conditional on easing trade tensions. In other words, the central bank might go easy on its rate hikes if trade wars continue escalating and threaten economic growth for everybody—which is bullish for gold. 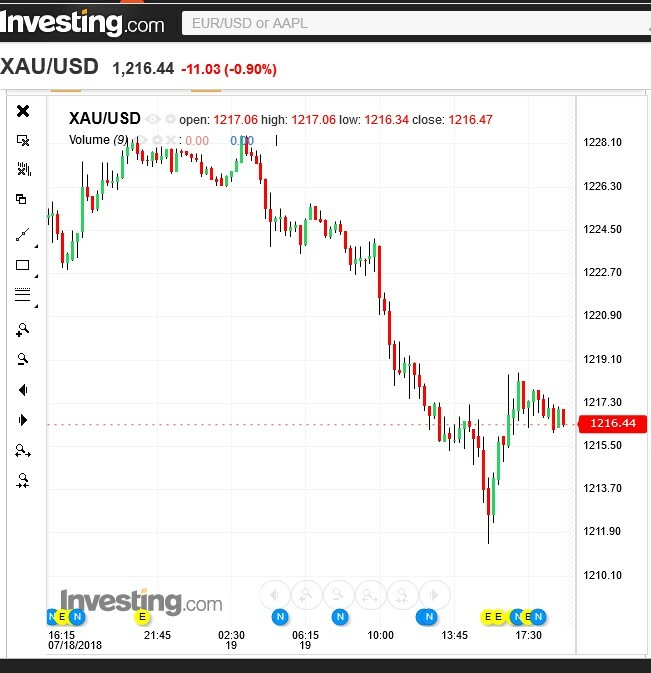 The speculation is based on a massive sale of 340 tonnes of paper gold of COMEX gold futures that were dumped on the market in two waves yesterday starting precisely 9am and the second within the hour. The speculator offers hope to long-term gold bulls that a recovery is bound to occur due to short covering but warned that it could take much longer than the short time it took to make the dive. Is The Fed’s Tightening Cycle Actually Good For Gold?